NOTE: VRBO includes a 10% hotel tax in their price quote. This tax is only required for stays of less than 29 days. Whether you are seeking a relaxing retreat or an action packed vacation - or a little of both - this condo is for you! Only an easy 38 miles to Disneyland and 55 miles to Sea World, your days can be filled with adventure. All the excitement that Southern California has to offer is only a short drive away. Ski in the mountains and surf in the ocean - all in one day! But if you prefer relaxation, the condo is a perfect escape. Enjoy ever changing views of the beautiful cliffs, palm trees, waves and wildlife preserve which is adjacent to the unit. Enjoy the sounds of the surf and the birds. Watch the dolphins and pelicans - and sail boats and surfers - from the living room, dining room and balcony. Take a short walk down the paved path to the beach - or drive down and park a few feet from the beach. The beach offers year-round restrooms and showers and a cafe in the summer. A recently completed beach-side trail is perfect for the stroller or the runner. You can walk to the pier (be sure to stop in at 'Fisherman's' for a fantastic meal right on the pier!) and then continue all the way to North Beach. San Clemente is a charming village straight out of the olden days of Southern California. Whether unique shopping or dining is your pleasure, there's plenty of both. There is a very active arts community as well - and be sure to catch the Farmer's Market for fresh food and flowers as well as displays by local artists. And as the brochures all say - San Clemente has the perfect climate! Trade your snow shovel for a pair of flip-flops! My grandmother took this 1958 photo of our family enjoying the beach in front of where the condo was later built. Sit down, white water view from balcony, living room and dining room. 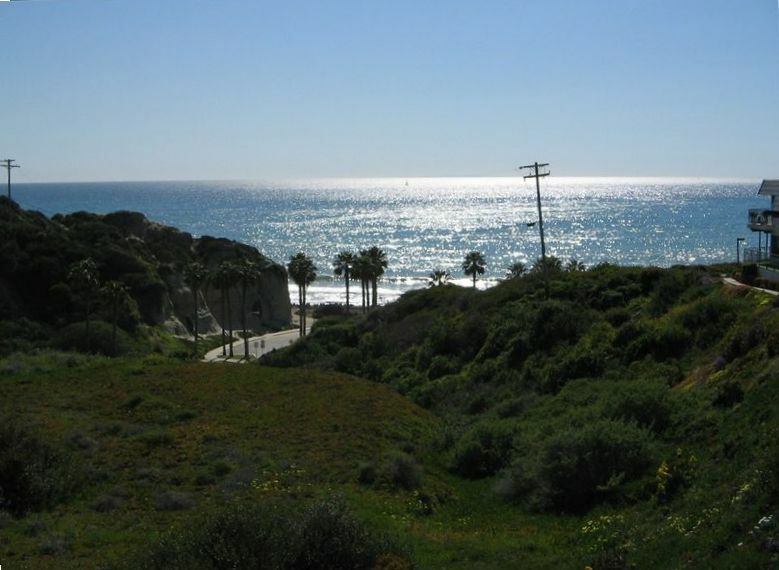 There is only the nature preserve between the unit and Calafia State Beach. There is room for more at the dining room table using folding chairs in the condo. Pam’s home has a wonderful flow and after a few hours we felt completely at ease. It is high up, facing the ocean and the surroundings are peaceful and lush. The beach is easily accessible and there is a lovely path along the shore for walking and relaxing. Pam was friendly and helpful, the kitchen fully equipped and conducive to pleasant evenings cooking while the sun was setting, gloriously . All in all a most satisfying taste of Southern California. This is a return visit for us to Pam's condo situated in a perfect location in San Clemente, directly above the State Beach. It's in a quiet complex and yet close to easy freeway access. We thoroughly enjoyed time spent in the condo. It's comfortable and nicely furnished, the kitchen is well-equipped, beds are comfortable, and the view of the ocean is spectacular. We highly recommend a stay at this condo if you ever get the chance! Best condo on the beach! From the moment we opened the door and immediately saw the amazing view of the ocean, we knew we had made a wonderful choice of condos to stay at in San Clemente. Everything was perfect! Home isn’t just a Place - It’s a Feeling!! There is a reason we want to return time and time again- Pam’s place just feels like home!! Warm and welcoming, clean and attention to detail. You can walk to the beach or sit on the balcony and see the white water breaks. A retreat, in every sense of the word! 5 Stars! This is an amazing property. We stayed here for 7 nights. Walking distance to the beach (which had nice sand) and cute little park/grassy area. You can hear the waves from the balcony and dining room. Nice sized bedrooms and walk-in closet makes it great, should you do long term rental. Loved this place, and the town~nice and quiet. The condo kitchen is well supplied with NICE dishes, glasses, utensils, crockpot, Keurig, etc. The covered parking, pool and hot tub were a bonus. The owner was also very communicative and gave great instructions. Should we come to Southern Cal again, will definitely stay here again!! We had such an amazing trip staying in Pam's condo. Not only was the appearance of the condo so accommodating and welcoming, but so was Pam herself. She was extremely responsive and went over and beyond for us. She was more than just someone that rented out her condo to us for the week, but she treated us like friends. There was a very good vibe from her and the condo, and you are likely to have a great time staying in this unit! The views are unreal. Every time we entered the condo, we were blown away. The unit was very clean and prepared nicely for our arrival. And the bed was so comfortable! We had great sleep the 8 days we were there. The location to the beach was perfect. Only a short, short walk! We enjoyed the walking path as well and went on it a few times. We can't say enough positive things about this unit, the location, and working with Pam. It was a trip we will remember forever!! 37 miles to Disneyland; 30 miles to Legoland; 60 miles to San Diego Zoo, Balboa Park, the Maritime Museum, Petco Park and a vast assortment of restaurants; 57 miles to San Diego Zoo's Safari Park.